Square Enix today announced that the World Transfer Service will open Oct. 15–and just to make sure everybody can group up with their friends, transfers will be free through Oct. 21. Users will be able to transfer their characters from the Final Fantasy XIV Gil Mog Station, though certain worlds may be unavailable because of fluctuating populations. More than a million players have registered a month into the game’s launch, after all. 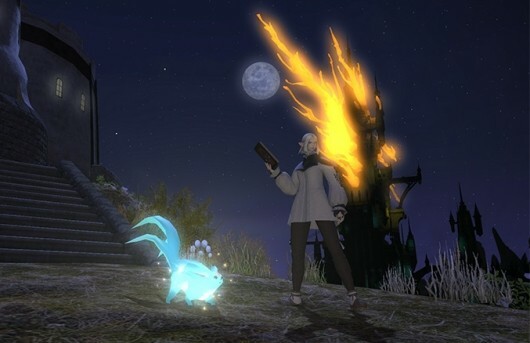 It’s perfect timing if you want to celebrate All Saints’ Wake with formerly distant friends: the Halloweeny event decks out the world of Eorzea with costumes and suitably spooky decor, and opportunities to be tricked and treated in a new quest which stars a roving circus troupe. It will run from Oct. 18 to Nov. 1. We already enjoyed Square’s resurrected MMORPG quite a bit, but more is on the way. Check out the video below for a look at FFXIV’s upcoming PvP arena Wolves’ Den, which sets two teams of four heroes against each other. This entry was posted in Other Games.